Our same durable padded Napa menu cover material, with the same color selections and layout options, including album style corners to hold your menu inserts. Our Napa Deluxe incorporates outside stitching with smooth gold, silver or black metal corners. 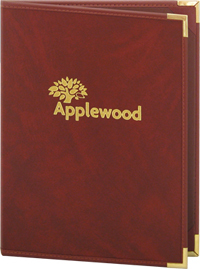 Similar to our Napa menu covers, the Seville series is a highly durable product with a soft leather-like feel, but unpadded, and with coordinating stitched trim. They come with metal corners and clear plastic interior pockets to hold your menu inserts. 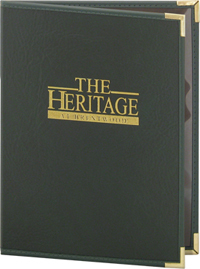 The same high-quality product as the Seville, but enhanced with album style corners to hold your menu inserts. Unpadded only. Available in six color choices and five layout options. May be foil stamped or blind debossed.